Blogtown: The Holiday Kick-Off In Venice - In The Spirit! What a fun weekend in Venice! 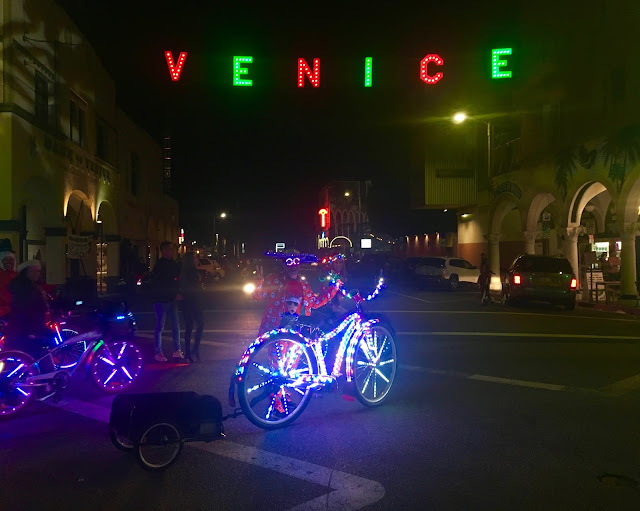 The annual Venice sign lighting happened on Saturday night, and it seemed like the whole community came out to celebrate with each other. Everyone was in high spirits, and there were more than a few Santa hats being worn, so people were ready to bring in the Christmas season for sure. Live music was playing and you could hear it in the wind as we strolled over to Windward for the festivities. I stopped off for a quick cup of glögg (inspiring!) at my friends' Russ and Harry's pad on the way, and it gave you that happy, warm feeling inside to take with you. 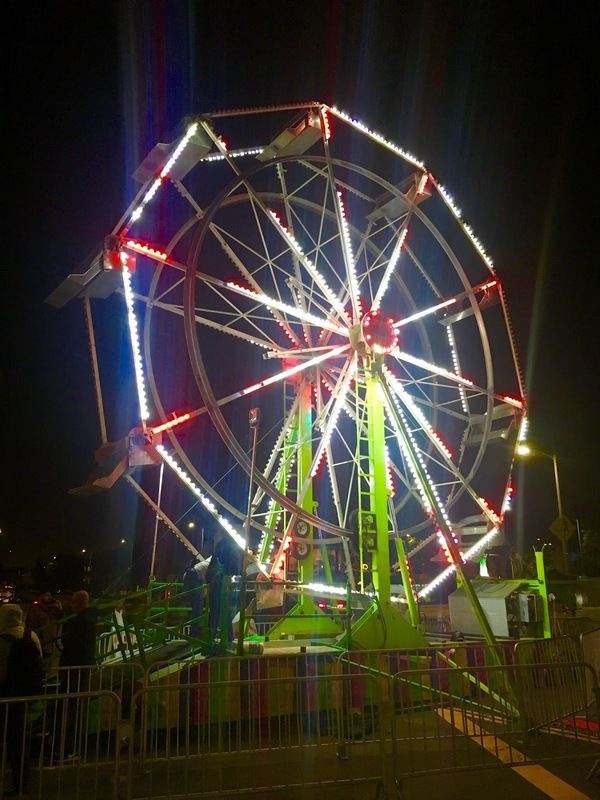 This year there was the new addition of a big Ferris wheel there to greet the people, and it was cool to see everyone loving it. We were also there shooting the happy times for our documentary 90291: VENICE UNZIPPED, as with all of the problems and actual crises happening in our community, there is also always a lot of fun to be had. That's a big reason why so many of us wanted to live here to begin with, and this kind of absolute blast also needs to be captured to tell the complete story. People were in great moods, feeling in love with Venice all over again, and thus, they were excellent interviewees. Thank you! Windward was lined with booths handing out everything from chili (Surfside friends!) to sticky rice, ice cream to hot chocolate, and all if it was complimentary as a gift to everyone. It was great. The streets were packed with holiday revelers, and you couldn't walk two feet without running into someone you knew and loved. 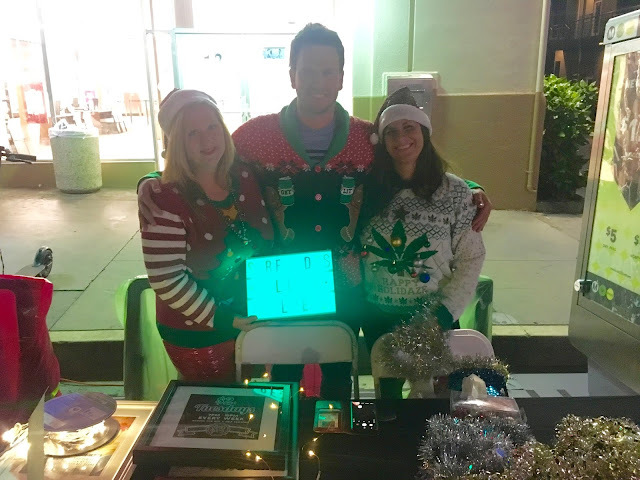 The Venice Chamber of Commerce put on a good party, and pretty much the whole town contributed to the fun. Venice Paparazzi was there with an adorable Venice holiday photo booth that had long lines waiting for their turn all night. The walls around the still uninhabited old post office (Ridiculous. Turn it into a community center!) 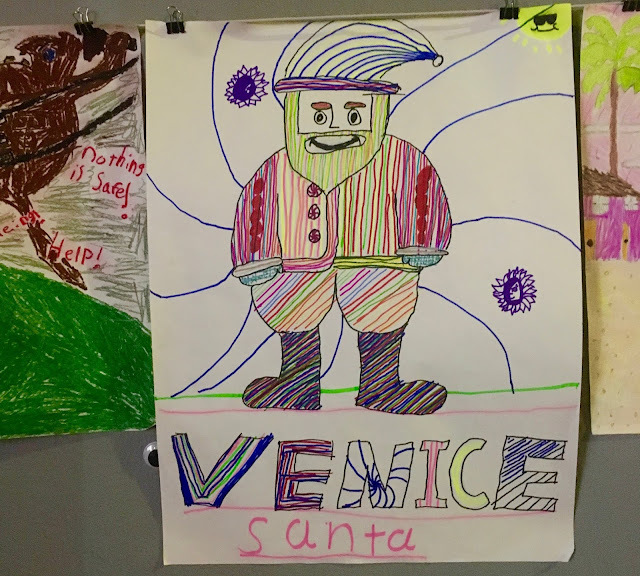 were decked out with posters from the contest for local kids to partake in, and I particularly liked this little Venice Santa. 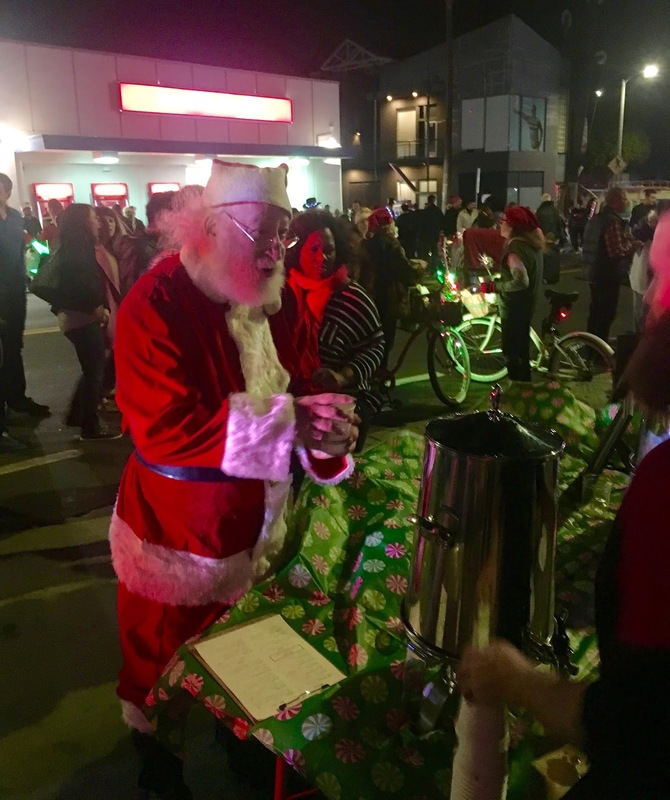 The "real" Venice Santa was cruising around getting hot chocolate and getting everyone to come and sit on his lap. It's probably pretty fun to be Santa. Bands played (though I didn't know any of them - who books this thing?) and people danced in the streets. Partiers would wait for the lights to change in the Pacific/Windward crosswalk in front of the Venice sign, and as soon as it would change, everyone would run out into the middle and dance or rollerskate or convulse (one person's iffy dance moves) real hard until the light changed and then run back behind the barricades. THAT is the Venice spirit I love so much. 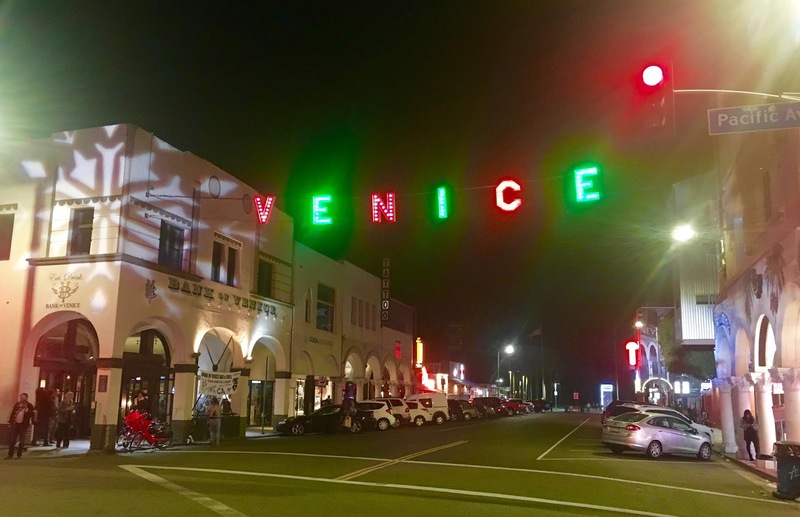 Andy Summers of The Police lives in Venice, I guess, so he was chosen for the sign lighting duties. As usual, the various speeches went on way too long, and the sign that was supposed to be lit at 8:00 p.m. was still dark at 8:30. Local politicians and people on boards - no one cares to listen to you hearing yourself talk. It was to the point that a chant started up ... "LIGHT THE SIGN! LIGHT THE SIGN!" because frankly, no one was listening to the speeches anyway. Dancing and greeting friends continued until finally you could hear the 10-9-8-7-6-5-4-3-2-1!!! - and the sign lit up in its holiday outfit of red and green! It's funny that light bulbs can bring such a thrill, but there we all were, loving it. Everyone raced to the intersection to take photos under the newly lit sign, and we were no different. 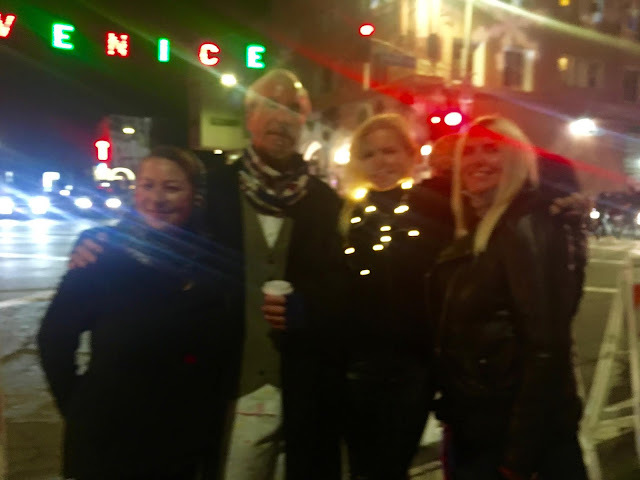 Old friends and new took photos together, and it was the perfect way to kick off the holiday season with good Christmas cheer and good Venice vibes. The party moved on to various watering holes around the area, and Surfside was serving up a special holiday bourbon punch that was our main draw. 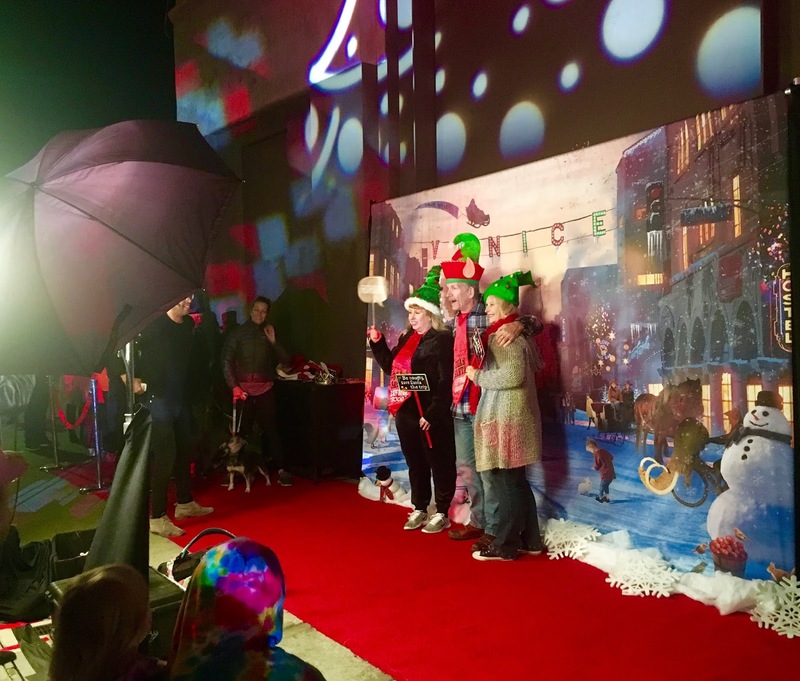 I took off in my new Venice sign red stocking hat to meet up with friends at Cinema Bar to see Matt Ellis play, and people wanted one (Get yours through the Venice Chamber!). 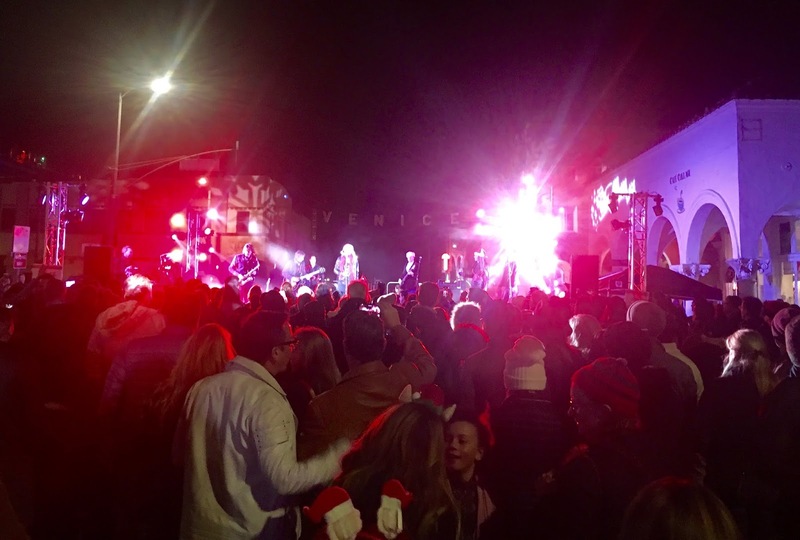 It was a truly joyous time in Venice, and all seemed to be in the mood to celebrate, and take our minds off of all of the heavy things happening in the world. Thank goodness - we needed it. I hope you were there, I hope you also had a blast, and I hope this will be everyone's best holiday season yet ... and that we'll all do our best to make it so. For everyone.